Thrill your guests with these new zoo features! Order the Triassic Mini Expansion online through our website today! Your zoo has been running smoothly for months, and your guests have almost universally loved their experience. The success has created the opportunity to add more features, and so dozens of additional blueprints are stacked neatly on your desk. Which will you choose? 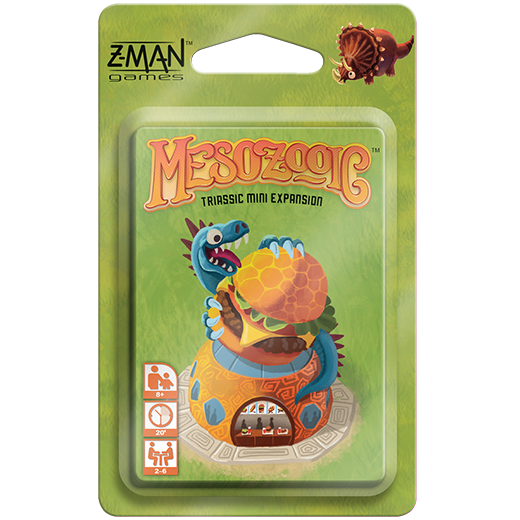 The new era of dinosaur prosperity continues in the Triassic Mini Expansion for Mesozooic! Thrill your guests with new advanced features and the gargantuan Megazooic: a rules variant for how to play with up to 12 players. The Triassic Mini Expansion is available for pre-order now through our website and is a Z-Man Games web exclusive. This mini-expansion introduces three new advanced cards types, all of which utilize the beautifully-sculpted topiary found on certain basic cards as well as on every card back. Build cafés near shady topiary, place lovingly-cultivated conservatories, and utilize skilled groundskeepers to provide a touch of elegant flora to your dino zoos. Your guests will need to eat while at your zoo! After grabbing food, guests will want a nice shady spot to sit and eat. For each café card in your zoo, flip one other card facedown. 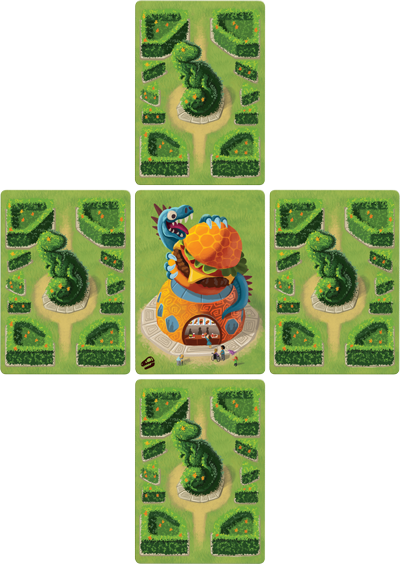 When sliding the cards in your layout, you want to get the topiary next to the café (orthogonally not diagonally). Each café in your zoo will score 2 points for each topiary next to it. The conversatory’s roots have spread out and dug deep into the ground. Those roots refuse to be moved. 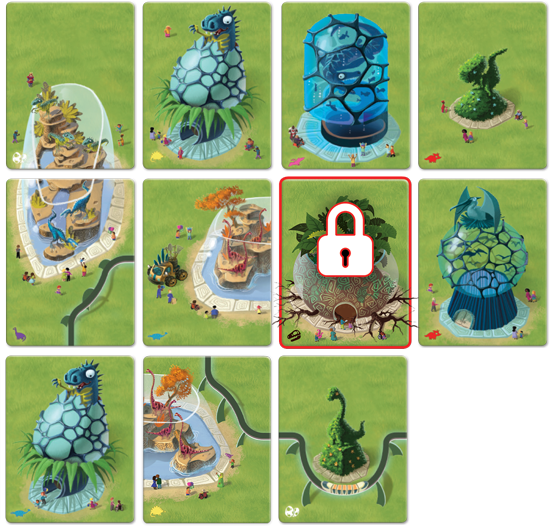 After placing the cards to create the grid for your zoo layout, you’ll have the tough choice of whether or not to move the conservatory. If you don’t slide the conservatory, that card is worth 4 points. However, if you do decide to slide the conservatory, that card is immediately flipped facedown, transforming the card into a topiary. Moving the conservatory could help you to match up attractions, enclosures, or monorails to give you more points, making the sacrifice worthwhile. You can choose to flip the conservatory at any point during the 45 seconds of play. The groundskeepers make the zoo beautiful for guests. If an attraction doesn’t function or an enclosure isn’t complete, the groundskeeper can add a topiary instead. If you drafted a groundskeeper, you’ll have the chance to flip over cards at the end of the round. Once your director has been placed in the empty spot, look for cards that aren’t scoring. Maybe you couldn’t quite match up an enclosure. Flip the groundskeeper card, the enclosure half, and any other cards in your zoo facedown. Now those cards each score 1 point as a topiary. 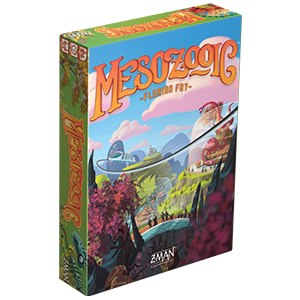 Mesozooic plays up to 6 players, which is a good group size already, but for a truly dinosaur-sized party you can combine the Triassic Mini Expansion with two copies of the Mesozooic base game to play what we call, Megazooic. The Megazooic variant allows you to choose, build, and score with up to 12 players. 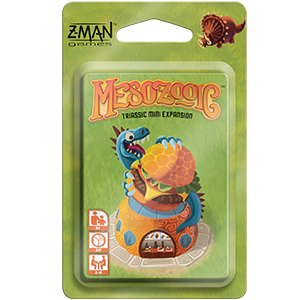 Pre-order your copy of the Mesozooic Triassic Mini Expansion today and wow your guests with these marvelous new features! The Triassic Mini Expansion will be $6.99 and release in Q4.